Police detectives have shot to death a suspected armed robber, wounding another in a gun battle at Inyi community in Igboeze North Local Government Area of Enugu State. 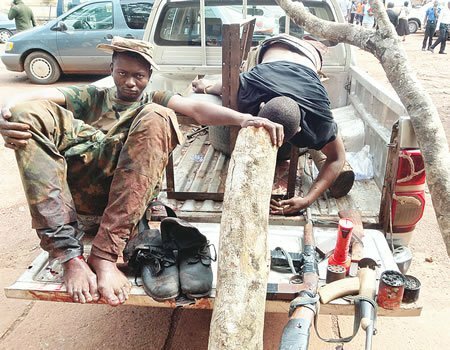 The suspects who were allegedly dressed in camouflage, were arrested at the border between Enugu and Benue states. Amarizu stated: “Police operatives of the Counter-Terrorism Unit of the command on duty on the Enugu -Markudi Road of Nsukka Axis had received a distress call that armed hoodlums had blocked Nsukka Markurdi Road by Inyi in Igboeze North Local Government Area and were wreaking havoc on their victims. The state police spokesman further said others believed to have been touched by the operatives’ bullet escaped with bullet wounds. “The state command of the Nigeria Police is appealing to members of the public particularly hospital operators/owners to watch out for anyone with suspected bullet injury and report promptly to any nearby police station for necessary action. Some of the items recovered from the suspects, he said included heavy logs of wood used in blocking the highway, two double-barrel guns fabricated to double as AK 47 rifle, some amount of money believed to have been snatched from their victims, a pair of booth and a torchlight. Meanwhile, the Enugu State Commissioner of Police, Emmanuel Ojukwu, has applauded the efforts of his operatives, adding that the command would continue to maintain a functional security for members of the public, as well as motorists on the road.